It’s one of the dividing wedges that can be driven straight through the chicken community: should you use supplemental light for chickens during the shorter days of the year? A hen’s egg laying is triggered by sunlight. When the days get shorter, egg production falls off. Chickens need 14-16 hours of light per day to continue laying eggs for you. One way to combat this lack of sunlight in the colder months of the year is to add a light on a timer in the coop to “trick” the chicken’s pituitary gland and help ramp up normal egg production again. Those who don’t use supplemental light for chickens argue that adding light to the chicken coop to trick a hen’s body into laying year-round is unnatural and wears them out faster. Those who do use supplemental light…basically need eggs. We do use supplemental light in our chicken coop. My particular homestead journey dictates that if I’m feeding you in one of my barns, you need to produce something for me. Farm life. It’s rough, yo. Additionally, I personally have not felt that the use of supplemental lighting has decreased the life span or egg laying years of any of my feathered friends. But I say that with the caveat that in almost ten years of keeping chickens, the vast majority have not died from old age, but from predators in our yard or chicken adventures they did not return home from. Did I mention farm life is rough? Use a timer. You will not be as awesome as remembering to turn the light on as you think you will be. Use a regular ol’ bulb. 40-60 watt is fine. Provide a total of 14-16 hours. Any less and you’re wasting electricity. Any more and you’re just being a jerk. Pay attention to the sunrise and sunset and do the math to figure out how much extra light you need to add to total 14-16 hours. Set the extra light to come on in the morning, not at night. For instance, instead of having your light come on at 5pm and stay on until 9 pm, set the light to come on at 3 am and turn off at 7 am. Why? When a light suddenly clicks off at 9 pm in the winter, it will be pitch black in the coop and you may have some chickens who didn’t make it to their roosting spot, are stuck at the feeder, aren’t by their best buddy hen, etc. However, when a light clicks off at 7 am in the winter, it’s already light out and the chickens can see what they’re doing and go about their merry day. Now to be clear, I don’t care either way. 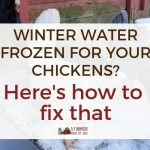 I always assume you’re going to make a choice regarding supplemental light for chickens because it’s the best choice for your particular homestead. It doesn’t matter to me if you put a disco ball with a spotlight in your chicken coop. You do you! But it’s the occasional hypocrisy that I encounter that gets to me. What I wish we could all be honest about is this: some folks cry that giving a chicken supplemental light is unnatural and mean. Just a question, but where are y’all gettin’ your eggs in the fall and winter? Because what I see happening sometimes is that people play the less light is natural and it’s cruel to make a chicken lay eggs like that in the fall and winter and then those same people run off to the store to get their fall and winter eggs. …but I’m guessing all the eggs sold at the store are laid using supplemental light. You do you, but let’s not be hypocritical. 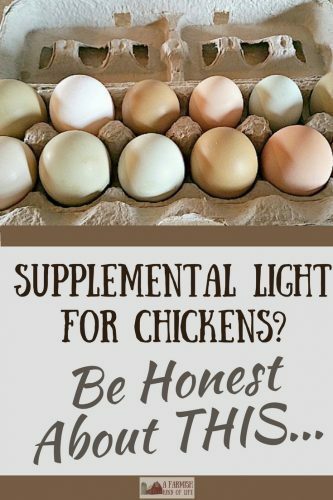 If you’re not using supplemental light because you think it’s cruel and unnatural to ask chickens to continue to lay the same amount of eggs in the fall and winter as they do in the spring and summer, and then you yourself don’t eat or use as many eggs in the fall and winter, that’s awesome. I see what you’re doing, and I give you a thumbs up. …and then you sneak off to the grocery store to buy 3 dozen eggs to complete your holiday baking? The crazy thing about eggs that you probably haven’t thought about? Eggs are actually a seasonal food. Crazy, right? That’s hard to wrap our heads around, especially since most of us have become accustomed to doing so. much. baking in the fall and winter months—at the same exact time that our little feathered friends are shutting down for the year. When we think about seasonal food, we think about what’s growing in our garden. We don’t ever consider what’s going on in the chicken coop. Thinking seasonally encompasses all the things we are growing and raising and producing on our farm—not just the green stuff that shoots out of the ground. So again, I’m all for people making their own choices regarding what’s best for their small farms and homesteads when it comes to the issue of supplemental light for chickens. But let’s make sure that in our choices, we’re being honest about the results of our decisions. Girlfriend, those eggs came from somewhere. And it wasn’t from a chicken that sees 9 hours of sunlight a day. We don’t use a light because we figure the girls need a break from the hard work they did for the last three seasons. We have about forty hens and although we only get about five eggs a day in the darkest part of the winter, we found the secret is to buy breeds that are known for laying at least a little in the winter. We have Orpington, speckled Sussex, Rhode Island Red, Easter’s, Australorps, and Barred Rocks. You go girl!! Well said! I really enjoyed this article, I would rather keep my chickens producing than buy my eggs from the store. Thanks for pointing out the hypocrisy that occasionally comes from small farming and homesteading. I know a few people who have called me out for putting up light timers in my coop, I am going to send this link. Thanks! Great article, and another point to consider is that (I read this somewhere- don’t remember where) is that where chickens originated from there are longer hours of sunlight all year round, so really when you supplement light you are just recreating their natural habiat. I also think that it is good for chooks to have a rest now and then, but their yearly moult takes care of that.